The perfect rack just got better! This rack includes Swagman's unique Kraton gripper cradle surface to hold the bikes securely in place. Generous spacing between the large v cradles allows for easy loading and ample distance separating the bikes during transportation. Fits 1-1/4 and 2 inch receivers. Rack folds down to allow for tailgate access on trucks or SUVs. 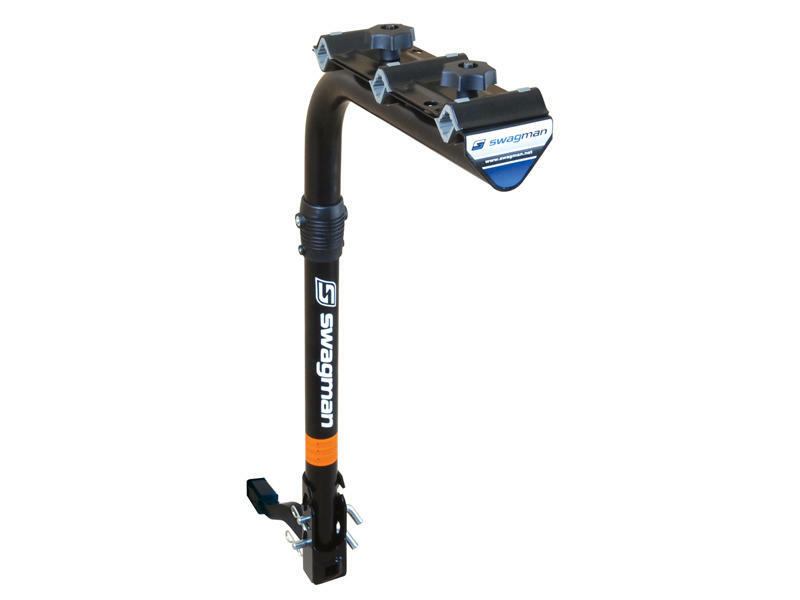 Swagman pioneered trailer hitch mounted bike carriers 15 years ago. The past 15 years have resulted in a range of bicycle carriers second to none. Our mandate is to build tough, durable racks, with a model for everyone. Over the past 15 years, we have created lasting products for active people to carry their bicycles and skis. At Swagman, we have never been satisfied with conventional solutions for bicycle transportation. Our marketing and design teams constantly look for new ways to provide a premium product that is user-friendly. In the past two years alone, our products have had over 20 in-line changes to supply our customers with the best product possible. These 20+ changes, combined with the release of 15 totally new products (including accessories), continue to make Swagman the number one choice in bicycle carriers. When a company makes hundreds of thousands of racks, it is necessary to ensure that the process is perfect to manufacture a Swagman Rac the same way every time. The whole process is documented and rigorously checked at regular intervals. The making of a bicycle carrier is a serious business and should be done to perfection. Our objective is to give the customer the very best product every time. In the design stage of building a new style of Swagman Rac, we conduct several different tests to ensure that the customer receives the best-made and safest racks on the market. An "in-motion" test simulates 100,000 miles of use on a fully loaded rack, which means the Swagman Rac has a very long life expectancy. The other type of testing is a "to destruction" test. With a Swagman Rac, this is extreme. The third and final type of test is a "static load" test which simply shows the potential load capacity of a product. All this care means safe products for the consumer, and no mishaps on the way to a biking holiday. "Copying is the sincerest form of flattery", and Swagman does have some look-a-likes. The truth is, these racks look similar, but are constructed very differently from a Swagman. From the quality of the materials to the consistency of the manufacturing process, these "clones" are inferior, and in some cases, unsafe. There is only one Swagman accept no substitute. Employees of Swagman and their friends are avid cyclists. 15 years of supplying bicycle carriers gives Swagman a network of satisfied customers and associates that ensure constant feedback to create ergonomically friendly products. Swagman products come complete to provide customers with safe, easy to use bicycle transportation. If there is a way to make products more flexible and user-friendly, Swagman will find it.